A few weeks ago, a friend was telling me about a pair of boots she had bought online. After trying them on and mulling over the purchase for a few days, she returned them. "I just want them to be perfect" - which got me thinking, what is the perfect boot? How many of us have searched for this elusive shoe?? Personally, I like simple shapes and classic details. Nothing too flashy or wild, and preferably something that can be paired with everything. The pairs above are just a few that I'd love to add to my wardrobe. 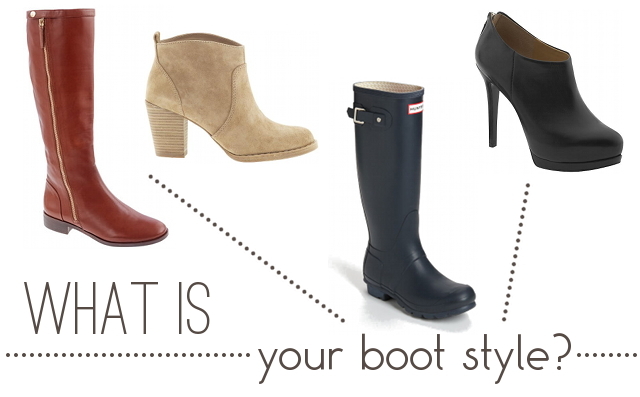 What makes up your perfect boot? Color, style, boot vs. bootie - gimme your thoughts! That J.Crew Harper boot is amazing! I'm wearing my new Nine West Pattycake boots for the first time. Got a great deal on Black Friday. The zipper on them isn't as cool as the zipper on the Harper, but they have a similar shape and heel. I'm totally saving up for the Harpers - they're my dream boot! An just googled the Nine West boots - love. I can't do booties. I feel like it makes my legs look shorter. Plus my jeans tend to be more "toothpick" (JCrew) and are never TOO cropped since I'm short. I love the Harper boot! I have a pair of boots I bought last year that have a top you can either pull up to make them knee-high, or put down for more of a "pirate" style (you know what I mean?). I adore them and wear them all the time. I teach 4th and 5th grade girls at church and they all notice when I wear them. I call them my Awesome Boots! They've convinced me that one of the items every woman should own is a pair of "investment" boots - something you can wear with just about anything, that's maybe a little more expensive but you'll have for ages.